Our Class 4 cold laser is one of only two K-Laser Cube 4’s in the Edmonton area, giving you the benefits of quick healing by stimulating the growth and repair of your tissues, muscles, cartilage and bones. Certain wavelengths of light are used to interact with tissues at a cellular level, increasing your metabolic activity. The laser decreases your healing time by increasing circulation and reducing pain and swelling. 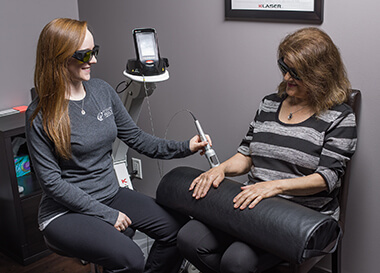 K-Laser therapy has been approved by the Food and Drug Administration and is widely used in Canada and the United States. K-Laser creates an optimal healing environment, reduces pain, and helps restore function. This advanced technology penetrates deep into tissue and offers continuous and modulating healing. A super pulse mode delivers deeper penetration with high power for shorter treatment times. An easy preset program gives us consistent, safe treatment outcomes. Do you have questions about K-Laser Treatment that weren’t answered here? Reach out to us or take a look at our K-Laser FAQ page. Regain your health, naturally. Reach out today to learn more about K-Laser Treatment in Edmonton.